Engine pumps developed for pumping water, clean or dirty to raise it to high altitudes with a 4-strokeor 2 troke engine with manual or automatic start, depending on the model. 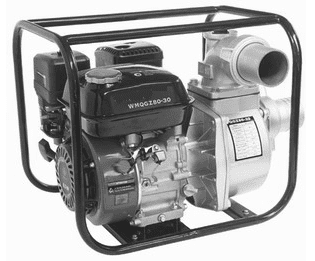 Pump with gasoline or diesel engine mounted on a chassis for easy transport. Specially designed for pumping water in rural areas or where there is no electricity supply. Supplied with orientable discharge port. Pump body and imnpeller in aluminum, metallic chassis painted with cataphoresis system obtaining a high resistance to corrosion. Gasoline or diesel engine, both air cooled. Supplied with bottom valve and fittings. Centrifugal twin impeller pump made entirely from grey cast iron for heavy duty operations. Designed for continuous operation.